Already 5 years...and this adventure goes on !! The Camerata enters the recording studio for an exciting program => our 1st CD THANKS TO YOU !! After 5 years of existence and no less than 50 concerts, the Camerata du Léman is recording its 1st album! Our work, combining technical requirements, stylistic researches and musical sensitivity, will find a first outcome in the recording of this CD, which will immortalize two works particularly close to our heart: Tchaikovsky’s «Souvenir de Florence» and Mussorgsky’s «Pictures at an exhibition». A masterpiece and a unique transcription ! A crazy gamble : recording a masterpiece of chamber music. The soloists of the Camerata gives an orchestral dimension to this piece originally composed for sextet, choosing to record it with sixteen voices of strings. This original album will charm the music lovers in search of renewal, will touch the sensitivity and imagination of young children! From each soloist of the Camerata, a huge THANK YOU for your help and looking so forward to present to our audience the fruit of our efforts ! This project ended successfully on 10/11/2017 15:00! You receive at home an autographed photo by all the members of the Camerata du Léman. You receive at home an autographed photo ; and you're invited to attend one of our rehearsals! You receive at home a copy of our future CD and an autographed photo and you're invited to attend one of our rehearsals! You like to offer music to your loved ones? Receive four copies of our future CD and you're all invited to attend one of our rehearsals! You pick out the instrument of your choice & one of the musicians of the Camerata du Léman will contact you for a 30'minute initiation! You will then be able to attend one of our rehearsals and ask any information to all the other members of the ensemble. You will of course also receive a copy of our CD as well as an autographed photo! You receive two invitations for the 5-year concert of the Camerata du Léman, on October 31, 2017 at 8 pm, Salle Frank Martin in Geneva. Seats will be reserved for your name in the Carré d'Or. You will of course also receive a copy of our CD as well as an autographed photo! You receive four invitations for the 5-year concert of the Camerata du Léman, on October 31, 2017 at 8 pm, Salle Frank Martin in Geneva. Seats will be reserved for your name in the Carré d'Or. You will of course also receive a copy of our CD as well as an autographed photo! You receive six invitations for the 5-year concert of the Camerata du Léman, on October 31, 2017 at 8 pm, Salle Frank Martin in Geneva. Seats will be reserved for your name in the Carré d'Or. We will keep you personally inform of our season 2017-2018, and will reserve you 2 tickets for each concert. You will of course also receive a copy of our CD as well as an autographed photo!
! THE CAMERATA INVITES ITSELF AT YOUR HOME ! 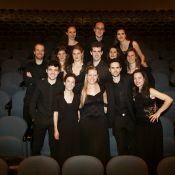 In appreciation of your outstanding support, the Camerata du Léman will give a private concert for you and your guests. The Date and the program will be agreed upon. You will of course also receive an autographed photo + two CDs + as well + Seats will be reserved for your name in the Carré d'Or for the 5-year concert of the Camerata du Léman, on October 31, 2017 at 8 pm, Salle Frank Martin in Geneva + 2 tickets at each concert of the 17/18 season. The Camerata du Léman : 15 young solo artists, united by the same passion of chamber music, and which particularity is to play without a leader. An crazy adventure of friends and music! Born in 2012, the Camerata celebrates its 5th birthday and enters in recording studio for its first album!